Homeschool foreign language teachers are absolutely blessed because our classes are usually made up of a small number of motivated students. The one great difficulty when teaching a homeschool language class (or an adult continuing ed class, for that matter) is that the class probably only meets once a week for about 2 hours. It’s hard to learn a language if you only use it once a week. We want our students to visit the language at least two, if not three, different days a week. So we want to find fun homework they will eagerly look forward to, and not put off until the last minute, twenty minutes before their class begins. A great benefit to students and teachers using TPRS (Teaching Proficiency through Reading and Storytelling) and CI (Comprehensible Input) is that the students do not have to fill in, and teachers do not have to grade any grammar worksheets! So, instead of grammar worksheets, we get to assign fun homework. And, in line with language acquisition principles, the homework should provide compelling, comprehensive, repetitive input. Happily, there are some great homework possibilities out there that do meet those requirements! I’ll list and link the Spanish opportunities, then move on to other languages. When you can access the video series, Mi Vida Loca, make sure you have Flash player, and your Flash player plug-ins are enabled. You can try out my Episode 1 Study Guide for free, and buy my other study guides singly or as a bundle, at my store, Crooked Trails Learning, on teacherspayteachers.com. At the store, click on the Category "MI Vida Loca" to see to see all the Mi Vida Loca products I offer- single or bundled episode study guides, Lesson Plans, and TPRS stories to use in class that relate to the vocabulary in Mi Vida Loca. Click on the category "Bundles" to go straight to the 22-episode Mi Vida Loca Study Guide Bundle. B. The Señor Wooly Website "Señor Wooly" is an absolute gold mine for Spanish teachers! Jim Woolridge has created memorable and slightly warped story-based music videos which provide a ton of compelling, comprehensible, repetitive input. As the teacher, your $75 membership allows all your students to play the videos at home, and work through a series of about 10 game levels for each song. I assign three levels per week - which means students are hearing the highlighted structures at least 80 times, and we stay with a song for 2 weeks. They get to level 6 and then move on to a new song, but you could assign the same song for 3 weeks, get to level 10, and really milk the material. Señor Wooly tracks your students’ work for you, provides printed curriculum materials with each song, and cross references the songs by vocabulary and grammar. Note: I try to match the Señor Wooly assignments to what we happen to be learning in class. But if there is no exact match it is not a problem - The website is so good, it practically teaches the students new structures without any input on my part. Sometimes we will officially get to a new structure (like ‘me gusta’ or ‘con’), and the students already know it from their Sr. Wooly homework! Go check it out, and then sign up at senorwooly.com. NEWS FLASH! Sr. Wooly has just released this summer a graphic novel about his flagship character - Billy, La Bufanda (Billy, the Scarf)! And he’s posted, for free, a clear and succinct series of videos explaining how to use TPRS/CI with a graphic novel (CI = comprehensible input). By the way, also for free on the website are 9 videos explaining how to play Woolridge’s best nine classroom games. I’ve used every one of his games with great success. C. Comprehensible Reading Your weekly homework can always include some comprehensible reading. I send students home with a one-page story that they can handle, and for homework they read it and draw a four-frame comic strip of the story. If the story is quirky enough, the comic strips come out quite creative - even the least skilled drawers will put in smiles, tears, smoke, funny signs or silly clothing - and then at the beginning of class we pass around the drawings so everyone can see each other’s drawing. Laughs all around. You can find many TPRS readings in TPRS books, and at teacherspayteachers.com. (For example, I have written a series of 11 funny stories, each of which employs four regular verbs repeatedly, that you can find here. As the year progressed, I assigned TPRS leveled novels for students to read as homework. We did read the first chapter of the first book together in class, and then, due to time limitations, we did virtually nothing with the books in class. However, when students read in the target language on their own it contributes to their fluency, just like reading for fun in English contributes to your English language abilities. My students enjoyed the books, and came back after reading Chapter 2 reporting that they didn’t really translate it, they just read the book! TPRS novels are available at Blaine Ray’s website, tprsbooks.com, tprstorytelling.com, brycehedstrom.com and Amazon. NEWS FLASH #2! As you get into the novel-reading aspect of TPRS, TPRS Publishing now has many online e-books, that come with audio, flipbook, and activities for your students. Reading novels is an integral part of the TPRS method. The novels are specifically written to provide compelling, comprehensible, repetitive input, using a short list of high-frequency words. I’ve read and enjoyed all the novels. In my classes, I have assigned the hard copies for homework, but I have not yet used the e-books, as this is a new feature. 30 different novels and curriculum books are available as hard copy and as e-books! Like Sr. Wooly, the e-book website tracks your students’ work, so you don’t have to correct homework. Each e-book costs about $5.00/student, a little less than the price of the hard copy. Both are available at: tprstorytelling.com. D. Slightly More Advanced Videos. When you move to Level 2 Spanish, good (compelling, comprehensible, repetitive input) homework gets a little more difficult to find. You can still use Sr. Wooly and the TPRS novels. In addition, one possible storyline video you might consider is Descubre. Descubre is a full curriculum which I have used in the past, but it is not TPRS/CI based. In fact, it moves very quickly through a traditional curriculum of grammar lessons and translation, so I don’t recommend using the full-on curriculum any more. However, the 9-episode fotonovela is captivating, like Mi Vida Loca. Have your students buy only the $40 Supersite to Descubre Level 1, and you can assign the videos for homework. Don't have students complete online assignments, just watch the videos for compelling comprehensible input. You will have a teacher subscription and can print up and hand out video study guides from the resources on the teacher site. Start with Descubre Level 1 at the beginning of your Level 2 class, and work through the units slowly for homework. Each unit has the video story, some culture videos, and a TV commercial that students can watch. Find Descubre at vhlcentral.com. You will be assigned a helpful salesperson. Don’t hesitate to ask questions! Sorry guys, the first part of Step 2, finding captivating video-based homework activities, especially at Level 1, is not so easy in languages other than Spanish. Sadly, no other language has a Sr. Wooly counterpart, so far. BBC does have a French video series, called Ma France. It is a little different form Mi Vida Loca. Ma France is designed for students who have at least a little bit of French. Also, it is not a running adventure story but a series of vignettes on life in France. Vista Higher Learning, at vistahigherlearning.com does have curriculum with video stories, like their Descubre, for French, German and Italian. Again, I wouldn't use those courses for Level 1, but for Level 2 homework, you could assign just the Level 1 Supersite videos (Level 1 first, to your Level 2 students), and hand out printed Study Guides from the Resources you will have as a teacher. 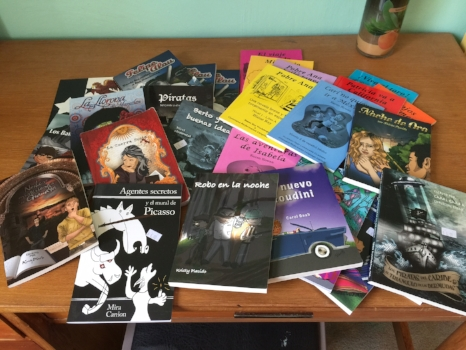 The good news is the TPRS novels do exist in other languages. tprstorytelling.com and tprsboooks.com have many novels and curriculum books in French. No e-books yet, but I am sure the e-books will be coming soon. Both websites have a bunch of hard-copy books and materials in German, and a few in Chinese, Latin, Italian, Russian, Japanese and English (ESL). As more great homework possibilities become available in other languages, I will post them on this site. Also, in Comments, please let me know about engaging CI homework activities you know about in any language, and I'll post them too!